The fifth and final page of Ace Pilot is up! Read it right here, or read the whole story in one go. Also, as promised, here’s the whole thing on Tumblr if’n ye wish. 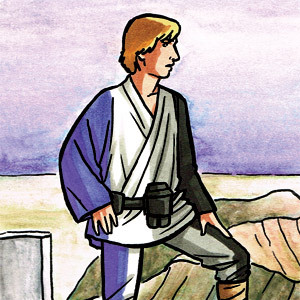 So now you know all about my headcanon of Luke Skywalker as asexual! If you’d like to buy the anthology this story originally appeared in, Dark Horse can hook you up with the Secret Loves of Geeks. DiNK is this weekend, April 13-14. I’ll be at table 372 on the third floor with a bevy of books and art for you to peruse, and, perchance, purchase. I will ALSO ALSO have a limited number of copies of Monster Journey, the all trans masc anthology with a brand new Valley of the Silk Sky story. So! Hopefully see you this weekend!